HIMSS19 is just a few days away, and our team couldn’t be more excited to get some sunshine and check out the latest and greatest in HealthIT. At HIMSS, a wide range of communities come together with one common goal, improving patient care. We checked out a few of the #HIMSS19 social hashtags to find out what to expect at this year’s show. 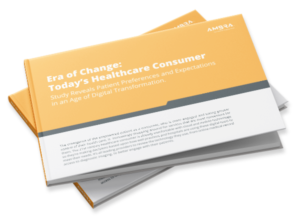 Both of these hashtags center around a topic we’ve discussed quite a bit here at Ambra Health, the patient as a consumer. Healthcare consumers, particularly millennials, are already comfortable with cloud and mobile technology, so they’re making decisions based upon how well practices and hospitals are using these digital tools. Patients today are very used to accessing just about anything online and are asking why they can’t have ownership of their own health care data, including imaging. An image-enabled patient portal offers patients the ability to work with their providers to better understand their own health and treatment plans. At Frederick Memorial Hospital, an Access My Images portal, powered by Ambra and featured on the homepage of their website, has seen an immediate impact with over 900 logins in just the first three months alone. Cloud technology can allow medical images to be transferred through the web allowing for faster turnaround time on reads, speedier diagnosis, and improved overall time to care delivery. Cloud archiving capabilities take this a step further and allow the secure storage of patient data in one unified location. “No area of healthcare is more dynamic right now than the shift in archiving to cloud vendor-neutral archives. Facilities want to see all the multimedia on a patient in one unified environment,” said Morris Panner, CEO, Ambra Health. A new trend across healthcare is emerging where all facilities, not just large hospital systems, are stepping away from on-premise PACS and shifting their archiving to cloud-based vendor-neutral archives. In a rapidly evolving imaging industry, standard PACS lack interoperability and the functionality required of modern image management practices. This hashtag centers around the frustration many physicians have towards their everyday date entry workflows. We predicted that this would be a big trend in 2019, particularly in radiology as the countdown is on to January 2020 when PAMA (the protecting access to medicare act) will require physicians to review appropriate use criteria before ordering any advanced imaging services like CT or MRI for Medicare patients. Many physicians feel that EHR data entry already takes up a large portion of their time and fear this additional step in their daily workflow. However, others are already seeking new methods of automation. Companies like Cranberry Peak are using AI algorithms to act as a digital assistant to physicians when reviewing appropriate use criteria. HIMSS is a great time to check out vendors that can improve daily workflows. The future of healthcare depends on the ability to more securely store, curate, and view data. To hear more about the exciting initiatives we are working on with our technology partners to securely expand data availability, swing by Ambra Health’s booth, 1221, or stop by the Google Cloud Booth (#2221) on Tuesday, February 12, from 11:30 AM to 11:50 AM , where a discussion on Ambra’s Cloud PACS capabilities will take place. Additionally, Ambra Health CEO, Morris Panner, will be speaking on Cloud VNA capabilities at the Amazon Web Services Booth (#5058) on Tuesday, February 12, from 1:00 to 1:30 PM. What is a Cloud PACS and Why Should Your Medical Practice Care? Wearing Your Heart on Your Sleeve? With Wearables, You Actually Can!